the weekend here was pretty quiet. kane and i had some good bonding time as matt was away-- he spent the weekend at the lake getting the boats in the water and wood split for summer bonfires and furniture set up and ready for the masses. he saw snow out in minnesota on friday night, and i wasn't jealous. i am so over the winter weather. am hoping for blue skies and lots of sunshine and bathing suit-begging days come memorial day. we experienced a chilly weekend in maryland, too. high winds made the below-60-degree temps even more brisk. we took advantage of the less than perfect weather and got busy on invitation assembly. the helping hands of my mom and future mother in law made quick work of cutting and assembling apple green envelope liners, stamping and stamping and more stamping. 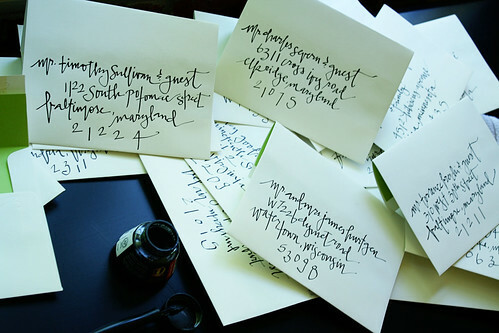 i was focused on perfecting my calligraphy-- or at least making it work. i find that after the first several envelopes, you fall into the ease of writing, and it becomes natural. the names of cities and states dance across the paper, and the zipcodes are given room to play. we are making good headway, and (hopefully) by this time next week, the most important piece of wedding correspondence should be en route to the guests. was planning to do some gardening on sunday, but with the weather i really had no bid for being outdoors. ran some laundry and vacuumed the stairs and clutter-busted around the house. 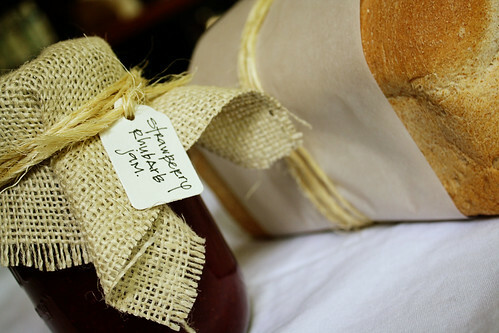 i delivered baskets of homemade honey wheat and strawberry rhubarb jam to the moms in honor of their day. aren't they just the best? made dinner for mom on sunday: crab quiche and a spring green salad, finished with cake + strawberry rhubarb compote + creme fraiche. 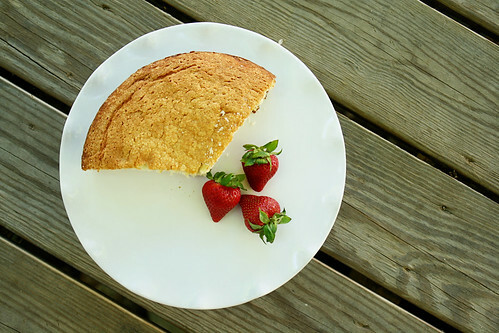 recipe-writing is in the works, don't you worry. + ps. went to the funeral of this little angel on saturday, and am continually thinking and praying for her mom and sister. another reminder to live every day to the fullest, and hug the ones you love. + pps. two months til wedding day! wishing you a good week-- and promising you'll see more of me.